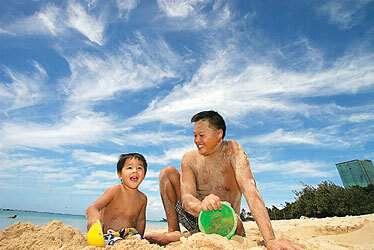 Adrian Tam and his 2-year-old son, Talan, enjoyed playing at the beach yesterday at Ala Moana Beach under some wispy clouds and blue skies. Funeral services for late slack-key guitar master Raymond Kane were held yesterday evening at Nuuanu Memorial Park. 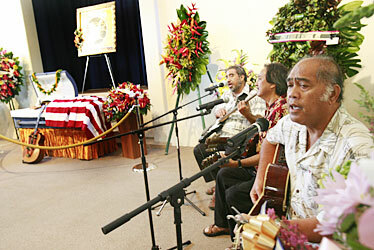 Local music luminaries Aaron Mahi, left, George Kuo and John Martin sang as they paid tribute to Kane. 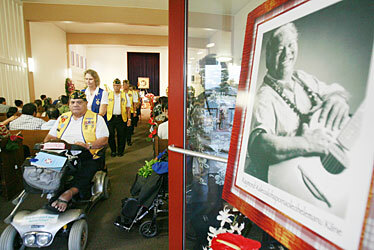 Members of the Veterans of Foreign Wars Post 849 Waianae left after paying their respects. Kane died Feb. 27 at age 82.